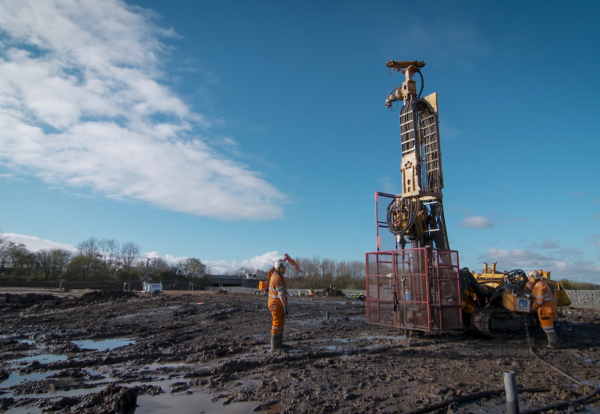 Aarsleff Ground Engineering have been awarded a drilling and grouting contract by main contractor Robertson Construction North East,as part of the Phase 2 development for a new retail park in Shiremoor, Northumberland. Following on from Aarsleff’s successful completion of Phase 1 works in November 2017, the latest deal includes the investigation and consolidation of underground shallow mine workings beneath the building footprints. Covering an area of 8500m2, Aarsleff have mobilised their Boart and Klemm 806 rotary percussive rigs for the drilling and grouting works across the site. Aarsleff will drill approximately 512 vertical and inclined 75mm diameter holes to 38m levels, and then mix and inject grout under pressure to consolidate any worked coal seams. Liaising closely with the Coal Authority, Aarsleff will be working with extreme care when drilling through the High Main Seam. Aarsleff Ground Engineering’s Geotechnical Estimator Chris Purvis said: “Aarsleff are already familiar with the area having successfully completed Phase 1 of this project in November 2017. “The drilling and grouting operation will be carried out in accordance with CIRIA document 32 and as a proud member of the British Drilling Association, we look forward to carrying out another high quality and value engineered scheme”.